Last night's PRWeek U.S. Awards highlighted the best work of the past 12 months as well as the previous two decades, but one young communicator eclipsed the professionals with his remarkable presence and poise. 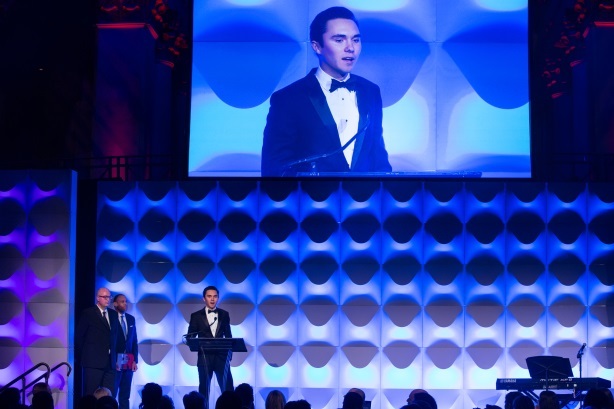 Eloquent, composed, and passionate, March For Our Lives cofounder David Hogg stole the show at the 20th Anniversary PRWeek U.S. Awards in Manhattan last night. I could wax lyrical about an amazing evening celebrating the best in PR and communications over the past 12 months and the 20 years before that. It was the best crop of work I have seen in my nine years editing PRWeek, and some of the categories were so brutally competitive that any one of the five shortlisted entries could justifiably have been named winner. It was a great night to honor PR legends Sally Susman and Richard Edelman, as well as the most successful agency at the PRWeek Awards over the past two decades – Ketchum – and the most enduring campaign over that time – Dove and Edelman’s Campaign for Real Beauty. It was a proud night for FleishmanHillard as it bagged Large Agency of the Year, and Zeno Group, which took home Midsize Agency and overall Agency of the Year. Day One Agency was thrilled at its Small Agency of the Year gong, as was Bospar with its Boutique Agency win. The groundbreaking Gerber Baby campaign by Daniel J. Edelman Holdings subsidiary Edible was a popular winner of Campaign of the Year, as was Weber Shandwick president Gail Heimann’s crowning as Agency PR Pro of the Year. T-Mobile took home In-House Team of the Year. But it was Hogg who really stood out among all these PR legends. He was named Communicator of the Year for 2019, along with his fellow organizers at March For Our Lives. Their experiences in surviving the mass shooting at Marjory Stoneman Douglas High School in Parkland, Florida in February last year led them to organize a march to advocate for stronger gun violence prevention measures. The march turned into a movement aimed at persuading elected officials to pass gun control measures and criticize politicians receiving money from the NRA. It extended into the 2018 midterm elections, when the group conducted an extensive tour to persuade young people to register to vote. Hogg became a pivotal figure in the movement with amazingly mature appearances on mainstream national media and at events such as March For Our Lives in DC. His self-control and unwillingness to be drawn into the petty squabbling that characterizes debate on cable news channels displayed a remarkable maturity in one so young. On meeting him last night, Hogg was a polite, engaging, but slightly shy young man, accompanied by the more extrovert Brendan Duff, another March For Our Lives organizer who handles PR for the movement. But as soon as he took the stage to accept his honor and started to address the audience, after a standing ovation from the whole room, he totally captivated the crowd with a passionate off-the-cuff speech that, as he said, came straight from the heart. His key messages mirrored the March For Our Lives mission statement of "Never again." He called on business leaders in the room to play their part in campaigning for a more sensible attitude to gun regulation. And he exhorted PR pros to take the views of young people much more seriously and to value their contributions, whether as an intern, potential employee, or customer. Hogg is set to attend Harvard after he finishes a gap year, a development that got Fox’s Laura Ingraham hot under the collar. Yet there were many senior PR professionals I spoke to last night who would be only too pleased to employ Hogg right now, without any further education, so impressed were they by his maturity and communications skills. He has suffered awful abuse both in-person and online during his journey of helping set up March For Our Lives. Last night, he recounted his experience at a rally in Texas that attracted many threatening protesters. Hogg eventually went out to talk to them to try and engage them in dialogue. Initially aggressive, they were struck by Hogg’s calm and cool-headed demeanor. "Are you a domestic abuser? Do you plan on hurting yourself or someone else? Or are you mentally ill?" Hogg asked them. "If not, then I’m not trying to take away your guns." Eventually, he cooled down the confrontation to such an extent that one of the protesters ended up in tears. It’s easy to forget the inciting incident that brought Hogg and his March For Our Lives co-organizers into the public spotlight, and the enduring impact that mass shooting will have on the rest of their lives. Only last weekend, Parkland survivor Sydney Aiello took her own life at the age of 19 having been unable to come to terms with the shooting and killing of 17 of her classmates and teachers, including her close friend Meadow Pollack. It was another stark reminder of why this issue is so important and how smart and passionate communications from the likes of David Hogg can help drive a narrative that will result in real social change and a safer future for all.